Saturn is the only planet visable to us at night this June. Face south at dusk, and you’ll see Saturn near a star of similar brightness — Spica in Virgo. Saturn is significantly higher in the sky than Spica and a bit to its right as you face south. 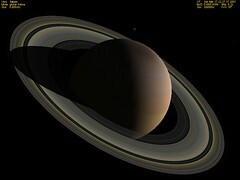 The ringed planet is now well placed for evening viewing, and remains in the evening sky until late September 2011. Mars and Jupiter are now higher in the pre-dawn sky. Jupiter, set against a background of very dim stars, dominates the eastern sky at dawn. Mars is dimmer and much lower in the east northeast. It has fully emerged from the sun’s glare, however, and will brighten slightly each morning. Venus does not rise until morning twilight. Look for it very low in the east northeast as day breaks. The Big Dipper is above the North Star, with its handle pointing up. From that handle, you can “arc to Arcturus” and then “speed on to Spica;” those stars are in the south at dusk. Leo the Lion, is high in the west at dusk. Antares, brightest star of Scorpius, the Scorpion, is in the southeast, with the ‘teapot’ of Sagittarius rising behind it. The Summer Triangle has fully risen in the northeast. The stars of summer are here. New Moon June 1, 4:02 p.m.
1st Quarter June 8, 9:09 p.m.
Full Moon June 15, 3:12 p.m.
Last Quarter June 23, 6:48 a.m. The full moon of June 15 passes through the Earth’s shadow, causing a total eclipse of the Moon. Unfortunately, we miss out on that one, too, as the eclipse occurs during our daylight hours. Anyone in the Eastern Hemisphere, though, can observe a central (and therefore especially long) total eclipse of the moon. At 12:17 p.m. on Tuesday, June 21, the sun is directly overhead at the Tropic of Cancer, the farthest point north where this is possible. This makes the midday sun as high in our sky as possible and gives us more daylight than on any other day of the year. This moment is, therefore, the summer solstice. However, the earliest sunrise for us is the morning of June 11 and the latest sunset is on June 30. Those of us who sleep through sunrise and witness sunset may get the impression that the days are lengthening all the way to the end of the month. By popular demand, our George Observatory will open to the public not only on Saturdays, but also all Friday nights in June and July (except July 8). The Discovery Dome, our traveling planetarium, will be set up each of these Fridays to show films throughout the evening.